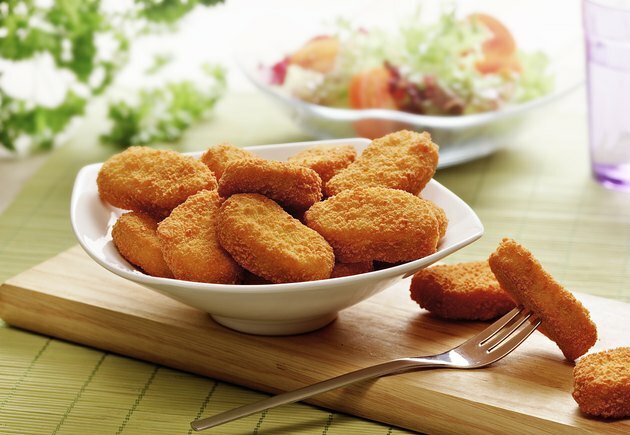 When breaded chicken breasts are deep-fried, the result is moist, flavorful chicken with a light, crispy outer coating. An old-fashioned cooking method, deep-fat frying is often shunned because of the large amount of fat involved in the cooking process. However, it imparts breaded chicken breasts with a flavor and texture unlike any other cooking technique. Breading keeps the interior of the chicken breast moist and tender, preventing the chicken from absorbing a large amount of oil. For deep-fat frying, prepare chicken breasts of uniform size so the pieces cook evenly. Bring the chicken to room temperature, and then dry the chicken thoroughly with paper towels before dredging the breasts in your choice of breading. You can use a commercial breading mix or a breading made of ingredients such as flour, bread crumbs or crushed crackers. Deep-fat frying doesn't require an electric deep-fat fryer or other special equipment. However, a large, deep Dutch oven or other sturdy cooking pan is essential, as the hot oil bubbles up and may splatter when food is added. A deep-fat thermometer ensures that breaded chicken is cooked at the optimum temperature. If the oil is too hot, the chicken may burn. If the oil is too cool, the chicken absorbs more of the oil, loses flavor and texture and becomes soggy. Choice of oil for deep-frying depends on personal preference. Peanut oil is often used because it doesn't burn easily. Vegetable, canola and corn oil are effective for deep-frying and are less expensive than peanut oil. Olive oil is acceptable, but imparts a stronger flavor to the fried chicken. Shortening is often used for deep-fat frying, but burns easily and requires close watching. Optimum temperature for deep-fat frying is between 350 and 400 degrees Fahrenheit, which is nearly at the smoking point. At this temperature, a breaded chicken breast cooks in approximately six to eight minutes, depending on size. To prevent burns caused by spattering oil, use enough oil to fill the pan to no more than one-third the depth of the pan. Bring the oil up to temperature, and then place the breaded chicken breasts in the hot oil. Cook the chicken breasts in small batches, as large batches lower the temperature of the oil. Remove the fried chicken from the oil with a slotted spoon or a wire mesh skimmer, then allow the chicken to drain on a thick layer of paper towels. Allow the oil to return to the optimum temperature before frying the next batch.